BLaST Intermediate Unit’s Department of Professional Learning and Curriculum recently provided training to school district teachers and staff that focused on the research evidence related to phonemic awareness to advance levels for primary students in grades kindergarten through second grade. We all know that spoken words are made up of individual sounds. These phon emes help a child be able to isolate, manipulate, segment and blend sounds into spoken and then written words. These early literacy skills are important for later reading success. 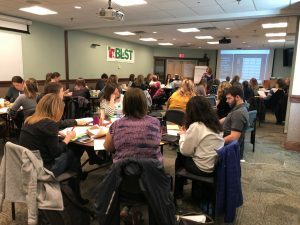 Organized by Dr. Amy Breon, trainer and consultant for the IU, the training was well attended by more than 50 educators from ten schools, made up of K-2 teachers and reading specialists from various school districts in the four counties BLaST serves. Participants were trained – on evidence based methodologies related to phonological awareness. They were led by Dr. Pam Kastner, Pennsylvania’s Training and Technical Assistance Network’s Lead Literacy Consultant, on how to successfully implement a direct, explicit and systematic phonemic awareness instruction into daily classroom practice. They practiced consistently engaging students with manipulating sounds at the word, syllable, onset-rime and phoneme levels. Lessons included skills in: letter sounds, rhyming, fluency, blending, identifying sounds, segmenting and consistency in hand motions. Participants were given an overview of the research behind the curriculum and its alignment with Pennsylvania Core Standards. “The research strongly supports phonemic awareness as an essential foundational skill related to reading success,” said Dr. Kastner.